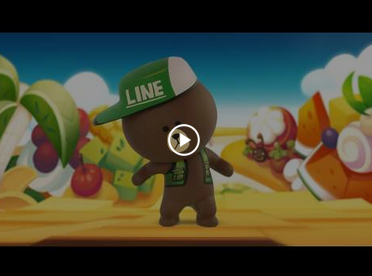 What kind of game is LINE Sweets? All your favorite LINE characters were just chillin' on their holiday cruise when they were suddenly swept away in a mysterious storm and washed up on the delectebly tasty shores of Sweetopia. Burst sweets, complete missions and help the LINE characters eat their way through this sweet puzzle adventure full of drool-inducing treats! Match up three or more sweets to burst them and accomplish different missions within a limited amount of moves. Rubies are the in-game currency used to buy items, Coins and Lives. You can get Rubies for free by sending Friend Invites or by fulfilling the requirements of certain Events. You can also purchase them from the in-game Shop. Coins are the in-game currency used to buy Normal Box items. You can either buy Coins with Rubies or get them as rewards for clearing missions. You need Lives to play the game. One Life is used every time you play. You can receive Lives as gifts from your friends and you can also buy them with Rubies. Up to 5 Lives will regenerate at a pace of 1 every 20 minutes. So I can't play without Lives? *Wait 20 minutes for a Life to regenerate. Up to 5 Lives will regenerate automatically. *Clear Stages and get them as rewards. *Get them as a Friend Invite reward." They are points that you get for sending Lives to friends or are awarded as a login bonus. You can use Friend Points to play the Friend Box draw. What are the Lucky Boxes? "There are 3 types of Lucky Boxes: the Friend Box, the Normal Box and the Premium Box. Each box contains different items. Check out what items you can get from each one by tapping on their screen. Tap tap!" They are tokens you get when you draw a character from the Lucky Box that you already have. With 7 badges of the same kind you can get a character from the next series for free! In LINE Sweets there is a Gateway every 30 Stages. You can unlock Gateways and move to the next Episode by collecting a certain number of Tickets or by paying the toll with Rubies. You need Tickets to unlock new Episodes. You can request Tickets from friends or get them in the Friend Draw. What are the stars that appear next to each Stage? You will be awarded up to 3 stars for each stage you complete depending on your score. You need to have a set number of stars to unlock Series 2 characters in the Normal Box. It's a bonus time you can unlock if you keep feeding characters the sweets they want. Satisfy their hunger cravings during Fever Time and you might be rewarded with a Treasure Box. So keep shoveling that food in! What is the Treasure Box? It's a reward that will be sent directly to your Message Box if you keep feeding characters till they are stuffed during Fever Time.